Alana Kelsall grew up on a farm in Victoria. She enjoys travelling, languages and spoken word. She is living in the UK at the moment with her husband and younger son, working on a novel about her life in Japan and completing her first solo collection of poetry. 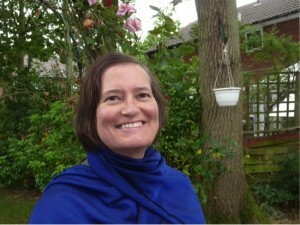 In 2010/11 she was shortlisted for the Newcastle Poetry Competition, commended in the Rosemary Dobson Prize and shortlisted for the Welsh Poetry competition. Her poetry has appeared in local magazines such as Blue Dog, Going Down Swinging, Poetrix and, most recently, online in Cordite. I read everything new that I can get my hands on! At the moment I’m immersed in Helen Dunmore’s latest collection, the Malarkey. I first read a poem of hers in the Sunday ‘Observer’ called Boatman, and was entranced by the simple language and the unexpected repetition of whole lines, sometimes only a word. I thought, this shouldn’t work, but it does. I’m still trying to figure out her clear-eyed unadorned style and learn from it. For poems, I write first in longhand and, after I can’t read the text anymore because of all the crossings out, I then transfer it to the computer. Once there, I find it harder to re-imagine a section that isn’t working. I frequently go back to the original page and begin again in longhand, on a clean sheet. My preferred time of writing is from early morning through to about two o’clock. I like silence. In fact, I can’t have music on anywhere near me when I’m faced with a blank sheet of paper. Now that my children are grown I write every day, almost all day when I’m working on my novel, in shorter bursts, especially at traffic lights, when I’m working on a single poem. I love the cocoon-like feeling of being in a vehicle and letting my thoughts drift. Lately, because my local coffee shop is a fifteen minute walk away on the other side of a wood, I find myself tuning in to the rhythm of walking and using that time to think up lines. Much safer! The change of seasons here in the UK is so spectacular that details of it are becoming a jumping off point for some of my recent poems. 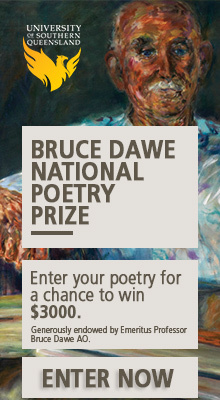 The main ‘elephant in the room’ that I see is the stipulation that entrants to most national poetry competitions must be not only Australian residents but ‘resident in Australia’. In the twenty-first century with the internet, this seems unnecessary. I think we carry our sense of identity with us wherever we are. I am particularly grateful to the Judith Wright Poetry Prize for allowing ‘Australian citizens (living anywhere) . . .’ to enter. Otherwise, having lived in the UK for over a year now, I would have been disqualified. The old ‘elephant in the room’, that is, the battle between academic/published poetry versus street poetry is becoming a non-issue. Or maybe the different types of poetry have been put through a rinse cycle and come out wearing the others’ clothes. Recent poetry that I’ve read online seems to me full of risk and energy, irrespective of the voice, the punctuation or the arrangement of lines. Perhaps self-publishing, the popularity of spoken word and the work of the Poets’ Union and Overload over the years have all had something to do with it. I look back on the Melbourne poetry community and their poetry readings in local pubs with nostalgia. I’ll be back!